The self-proclaimed neo-Nazi Brandon Russell, 22, arrested at the Key Largo Burger King last May after bomb-making materials were found in his car, was sentenced by Senior U.S. District Judge Susan Bucklew last week to five years in a low-security federal prison followed by three years of supervised probation. At the time of Russell’s arrest, he was found to be carrying fuses, an M&P 15 Sport 2 semi-automatic assault-style rifle, a Savage Arms Axis .223 caliber hunting rifle with a scope and 500 rounds of ammunition. Directly following the incident, Russell pleaded not-guilty but then changed his plea to guilty in September on federal charges of possessing bomb-making materials, and for improperly storing such materials. The two charges carry a maximum sentence of 11 years. Russell’s lawyer, Ian Goldstein, asked the court for leniency in sentencing citing his client’s clean record and immaturity as reasons. He said that this would be Russell’s first and only criminal conviction. Russell was arrested about 48 hours after he discovered the bodies of his two roommates, Jeremy Himmelman, 22, and Andrew Oneschuk, 18, upon returning home from duty with the Army’s National Guard. The fourth roommate, Devon Arthurs, 18, confessed to killing the two men for a making fun of his recent turn to Islam. While officers were searching the shared apartment, bomb technicians recognized a “white cake-like” material in a cooler as hexamethylene triperoxide diamine, or HMTD, in the attached garage. Russell admitted the material was his, prosecutors say. Police found radioactive materials belonging to Russell, as well as white supremacy propaganda and a framed photo of Timothy McVeigh, the Oklahoma City federal building bomber. They found enough explosive materials for the FBI to file the criminal complaint against Russell. Russell said the material was used to launch model rockets which he did as an engineering student. 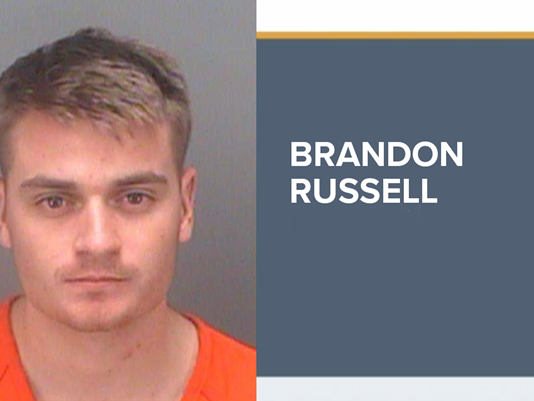 Russell told the police at the murder scene he was going to visit his father, but instead, picked up a fellow neo-Nazi, who has been identified as William James Tschantre, of Bradenton, and headed toward the Keys. The two stopped to purchase the guns along the way. It’s unclear what Russell’s intentions were in the Keys. Arthurs, however, incriminated Russell by saying he planned to target Turkey Point, the nuclear plant near the entrance to the Keys — a seemingly appropriate target for atomwaffen, the neo-Nazi group Russell created and whose name means “atomic weapon” in German. Tschantre told police that he and Russell had no specific destination in mind and had no plans to hurt anyone or do any harm.